Nonprofit educational and service organization dedicated to the promotion and dissemination of contemporary American multicultural literature since 1976. Host of the annual American Book Awards. 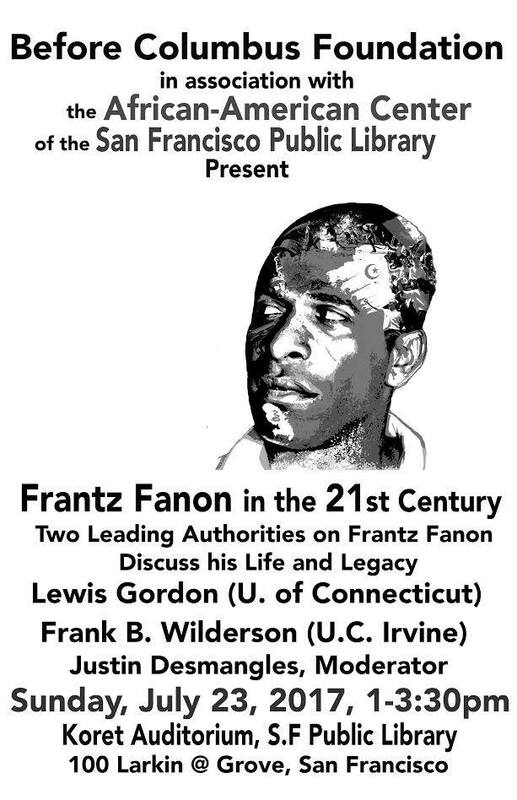 Frank B Wilderson, III (Red, White & Black: Cinema and the Structure of US Antagonisms) and Lewis Gordon (What Fanon Said: A Philosophical Introduction To His Life And Thought) join moderator Justin Desmangles (Before Columbus Foundation) for a discussion of the life and legacy of Frantz Fanon in the 21st century. Lewis R. Gordon is Professor of Philosophy at UCONN-Storrs; European Union Visiting Chair in Philosophy at Université Toulouse Jean Jaurès, France; Core Professor at the Global Center for Advanced Studies; and Honorary Professor at the Unit of the Humanities at Rhodes University (UHURU), South Africa. He also is the drummer for the band ThreeGenerations (https://www.youtube.com/cha…/UCedXg5Lmzi_RNq172eDLE3g/videos, Spotify, and other music sites). His most recent books are What Fanon Said: A Philosophical Introduction to His Life and Thought (NY: Fordham UP; London: Hurst; Johannesburg: Wits UP, 2015; in Swedish, Vad Fanon Sa, Stockholm: TankeKraft förlag, 2016), La sud prin nord-vest: Reflecţii existenţiale afrodiasporice, trans. Ovidiu Tichindeleanu (Cluj, Romania: IDEA Design & Print, 2016), and, with Fernanda Frizzo Bragato, the forthcoming anthology Geopolitics and Decolonization: Perspectives from the Global South (London, UK: Rowman & Littlefield International). His website is: http://lewisrgordon.com and he is on twitter at: https://twitter.com/lewgord. 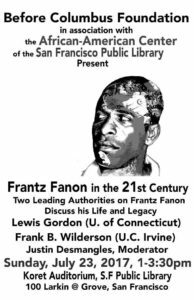 Frank B. Wilderson III is a professor in the Department of African American Studies at UC Irvine. He is also the Director of the Culture & Theory PhD Program. Professor Wilderson spent five and a half years in South Africa where he was one of two Americans to have held elected office in the African National Congress during the apartheid era. He also worked as a psychological warfare, secret propaganda, and covert operations cadre for the ANC’s armed wing Umkhonto We Sizwe. His books include, Incognegro: A Memoir of Exile and Apartheid; and Red, White, & Black: Cinema and the Structure of U.S. Antagonisms. In addition to being an activist and scholar, Dr. Wilderson is also a creative writer; and through his creative writing he has received a National Endowment for the Arts Literature Fellowship; The Maya Angelou Award for Best Fiction Portraying the Black Experience in America; the Zora Neale Hurston/Richard Wright Legacy Award; The Eisner Prize for Creative Achievement of the Highest Order; The Judith Stronach Award for Poetry, and The American Book Award. You can see video of her talk “Where Are The Gears? Thoughts on Resisting the (Neoliberal, Networked) Machine” here.